A few hundred people gathered at the Centre des Sciences de Montréal to protest fossil fuels this Saturday. 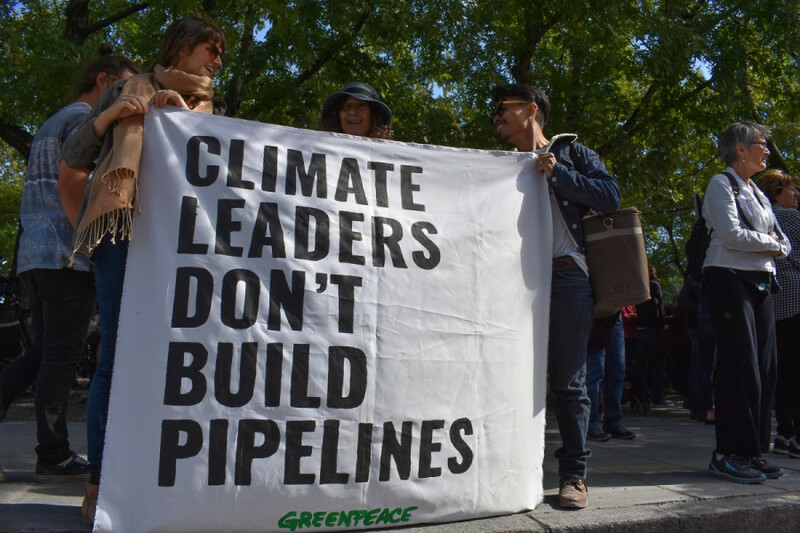 The rally—hosted by 350 Canada and Leap Montreal—was one of over 800 events held globally to put pressure on world leaders attending the global climate summit in California next week to make strides towards addressing climate change. The protesters hoped to draw attention to the issue as federal MPs just returned to parliament on Tuesday from summer recess. Nicolas Chevalier from Leap Montreal said it’s misleading for the government to frame this as a ‘transition’ to sustainable energy. “Natural gas is a fossil fuel much like the tar sands so it’s not a transition, it’s building another dependency which we don’t need and it’s not just,” said Chevalier. 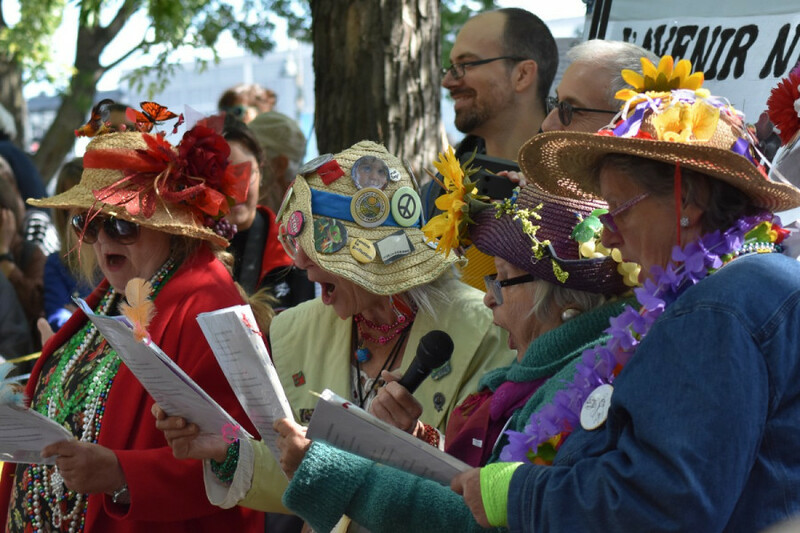 The rally gave a platform for local activists to talk about their own experiences in the face of climate change action. Quebec’s Center for Environmental Law, and environmental groups like Coule Pas Chez Nous, as well as rap battles for social justice, were all there. “The era of fossil fuels has passed. We need to leave it in the ground,” said Geneviève Richard, from the campaign on Jurassic Gaz and the board of Coule Pas Chez Nous. Between 2006 and 2010 there 24 wells in Quebec were fracked, some without consultation of the public or Indigenous peoples, since laws give companies the right to implement themselves without consent. Landowners can be expropriated if they refuse to give access to their land for the exploitation of oil. 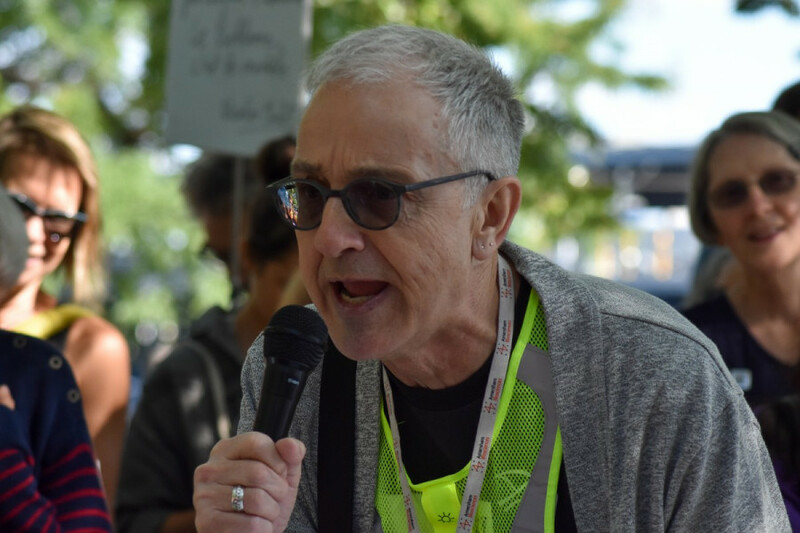 Richard also spoke out about the “devastation of the territory which amputates the link between First Nations and their land and perpetuates colonial violence,” making it impossible for them to exercise sovereignty on their territory. Richard went on to describe many of the long-term effects fossil fuels have on the environment, like the amount of water wasted moving the oil and the methane gasses released when wells leak. “What we need to remember is that there are alternatives to hydrocarbon fossils but not to water or our air,” she said. When oil is burned it produces CO2, but when it leaks it releases methane gasses which are much more pollutant in greenhouse effects. “These gasses roast our planet,” Richard said. In its current state, fossil fuel is more harmful for climate than any other hydrocarbon, including charcoal, continued Richard. Bianca Mugyenyi, the Co-Executive Director of The Leap, said that climate change and social justice go hand-in-hand because they both stem from a system that places profit before people. “We know the richest countries in the world are burning moats of carbon that’s now causing the floods, the fires, the draughts, and the storms we’re seeing sweep across the globe,” she said. One Raging Granny, Nancy Brown, can’t believe that they still have to fight for climate change over 20 years after forming. She said that Trudeau and his government have been ignoring what the people of Canada and the Supreme Court want. Though the project for Kinder Morgan’s Trans Mountain pipeline is suspended, the Liberals still plan on buying it, which Brown said is really coming out of the pockets of Canadian taxpayers. Brown said that though she finds it great that people are coming together, the power truly lies in government as they decide where to put money and draft up laws. But, Chevalier believes that true change does not come from above but rather from the grassroots.